From The BlogA Sunday Thought The Blog #WSRRA Being a Ranch Rodeo Producer from the Circle L! It isWednesday, July 23 which means in 3 days, Bridgeport, Nebraska fair grounds is going to be full of cowboys and cowgirls. You see, I am the producer of the 7th Annual Double A Feeds WSRRA Ranch Rodeo and Hubbard Ranch Bronc Riding. I am proud of my event. I am inviting each and everyone of you to come to Bridgeport. I plan this ranch rodeo with all my might. I start the year prior. I try to improve it every year. This year is my 7th Ranch Rodeo. This year I have added 4 women’s teams. They will be competing for a Championship Buckle. I am especially excited to add women’s teams to my rodeo. Being a Cowgirl myself, I know that this is a good addition to my Ranch Rodeo. I have also added more Bronc Riders! Twenty to be exact. Hubbard Bronc Riding is a WSRRA tour stop. Which means that Hubbard Feeds has added $2000.00 to the prize money and that WSRRA Bronc Riders get double points. 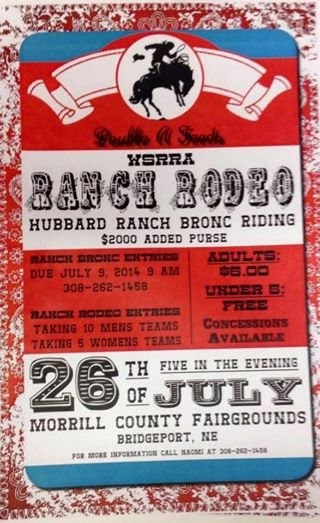 Come watch some good old fashion bronc rides. I take ten men’s teams. This year I have cowboys from Colorado, Wyoming, South Dakota, Nebraska and Kansas. I know that these teams will not disappoint you. If you want to watch some handy cowboys please join us on July 26. I would like to take this time and thank all of those that help me make my event successful. Being a ranch rodeo producer is sometimes a challenge, but it is something that I like to do. I could not put on a ranch rodeo without help. I have a lot of special people that help me. I believe that it is my place to produce a rodeo. I put my heart into it. My goal is that when July 26, 2014 comes to an end, I will have not regrets. I want to see smiling faces. I want to see the stands full. I want to reward the hard working teams with a buckle and I want to send my first ever Women’s Ranch Rodeo team to the WSRRA Finals. I will also send a men’s Ranch Rodeo team to the WSRRA Finals. I want to God to be proud. With that, I am inviting each of you again to come to the 7th Annual Double A Feeds WSRRA Ranch Rodeo & Hubbard Ranch Bronc Riding. Please see an article in Rodeo News about the Ranch Rodeo. Please see a blog post done by my dear friend Terryn Drieling. Darrell Kraupie, Sue Chaulk, Terryn Drieling, Cassie Mulloy, Santiago Ramos, AJ Bowman, Cody Loomis, Ty McBride, Tyrell Oliverius, Cade Loomis, Cassie Leithead, Doug Bowman, Greg Devrous, Dr. Dean Cline, Dean Anderson, Tom Drieling, Glen Amateis, Marc Page and all the WSRRA officials and Kylie Finneman. Bunkhouse Trailer Sales, Wolf Auto, Buckaroo Business, Twisted X Boots, Equibrand, Hatch Tack, Audra Lockhart, King Ropes, Cactus Ropes, Cactus Saddlery, Hubbard Feeds, Fast Back Ropes, Bridgeport EMS, Bridgeport Vol. Fire Dept.,Morrill County Fair Board, Morrill County Fair Foundation, Rick Newkirk and Ozark Saddle King. And THANK YOU TO ALL MY TEAMS & BRONC RIDERS. I could not be a producer with out all of you. This is my 2013 Ranch Rodeo Team!! I love each of these girls. YOU JUST CAN’T SEE THEM FROM THE ROAD.